On the night of April 14, 1865, John Wilkes Booth an actor by trade entered the state box at Ford’s Theatre in Washington D.C. and shot Abraham Lincoln in the head. He then vaulted over the railing and jumped down to the stage. Even though he broke his leg as he did this, he managed to escape through the theatre’s back alley--known as Baptists' Alley. While still in the theatre he yelled out, “Sic semper tyrannis” meaning--thus ever to tyrants. Just five days before this General Lee of the Confederate army had surrendered in Virginia ending the American Civil War. When Booth, a Confederate sympathizer shot Lincoln Mary Todd screamed and pointed toward the stage. Other screams of “murder” rang out throughout the theatre. Lincoln was rushed across the street to what was then Petersen’s Boarding House and placed upon a bed. He died the following morning at 7:22. He never regained consciousness. 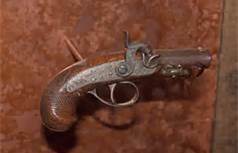 Twelve days after Booth killed Lincoln he was found hiding in Richard Garrett’s barn in Bowling Green, Virginia. After riding and searching for 24 hours the soldiers of the 16th New York Calvary surrounded the barn, set it on fire and started to shoot. When Booth’s body was dragged from the collapsed barn, he was so severely burned it could not be determined if he died from the fire or from a gunshot wound. In fact, the body could not be positively identified. Abraham Lincoln was the first American president to be assassinated. After he was shot, Ford’s Theatre was immediately shut down. The United States government purchased the building and used it for storage, an Army Medical Museum, and then as a library for the Surgeon General’s office. By 1887 it was being used by the War Department as a clerk’s office. In June of 1893, another tragedy struck the building. It’s 3 upper floors collapsed killing 22 clerks and injuring another 100 government employees. 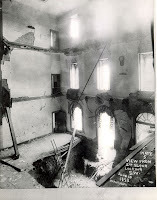 After this accident rumors started to circulate that the building was cursed. So it once again was used just for government storage. After 193l it sat unused. Then in 1964, the U.S. Congress approved its restoration. In 1968 the building once again opened its doors as a theatre. Its basement was converted into a museum in honor of Abraham Lincoln. This museum contains artifacts from the Lincoln Assassination, including the derringer Booth used to shoot Lincoln and the coat Lincoln wore to the performance. This theatre, along with the Petersen House across the street is now preserved as a National Historic Site. According to numerous witnesses, the building’s tragic events in 1865 still play out even today. People report hearing disembodied footsteps rushing into the state box, followed by a loud gunshot and screams. John Wilkes Booth is believed to haunt the stage area at Ford’s Theatre. According to many actors who have worked in productions at the theatre one particular spot on the stage located at center-left is always icy cold. In fact, several of these witnesses state that when they try to deliver their lines from this spot they became ill, even nauseous or they began to shake violently. 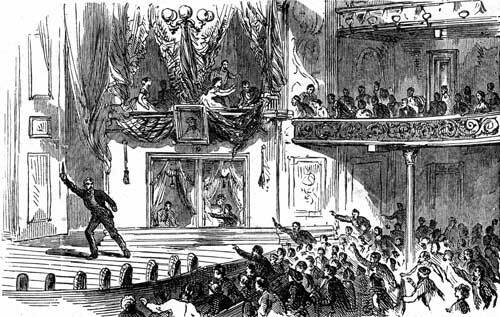 Others have seen Booth’s ghost running across the stage just as he did the night he assassinated Lincoln. 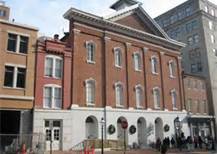 Some state Lincoln haunts Ford’s Theatre, but his apparition is seen more often at the Petersen House across the street where he died. His ghost is also seen at the White House. I talk about this in another post here. Before Ford’s Theatre closed in 2007 for major renovations, I took groups of around 100 teenage students over several Spring Breaks to tour Washington D.C., Ford’s Theatre was always one of our stops. We ended up in the basement in the long lines waiting for the single stall restrooms. Every time I was in this area I really got some intense, creepy feelings. I have always wondered if some of the items in the basement museum are haunted. Each time I have been in this area since 2009 to attend plays etc. I get the same overwhelming feelings. So when I was doing research for this post, I was surprised to find no one else has experienced these same feelings or mentioned this area of the theatre as being haunted. * I wrote another post about Mary Surratt and why I do not feel she was one of Booth’s co-conspirators. ** John Surratt, Mary’s younger son was also considered a co-conspirator, but he was the one who was never convicted. I just returned from a visit to Ford's Theater and the Peterson House. Like, you I also felt a presence or presences in the basement area. I also felt a strong presence in the bedroom where Lincoln died. I felt that Booth may still be hanging around the theater. I would not be surprised if Mary Todd might also be stuck reliving that horrible night in her mind, wherever she may now be. The theater itself exudes a sense of somber reverence. I felt compelled to remove my hat upon climbing the stairs. There's still lots of emotion kicking around those theater walls, even to this day. I hope whomever might be left hanging around may one day find peace. You are the first person to verify what I felt--thank you. I've been to Ford's several times. Every time, I can feel the atmosphere strongly from the moment I arrive until I leave. The energy in the building is so thick you could "cut it with a knife" so to speak. I wouldn't necessarily call it a negative feeling... but it's different from anything I've felt anywhere else. Almost as if the energy and emotions from that night are imprinted on the environment? I also noticed that the the first time I went, I felt this strange... addiction, for lack of a better word, to the place. An overwhelming compulsion to stay as long as possible, and to revisit as often as I can. Which I do. Now, I do get emotional about certain places, but Ford's is the only place where I've ever sensed that my feelings came from *outside* myself, and developed instantaneously, like I'd been there many times before. Sorry if this makes no sense whatsoever! It's difficult to describe because I can't think of a comparison. It has been a while since I have been in this theatre but the feelings I got were so strong I can't forget them. Thanks for sharing. I left the theater last night, after exploring it for several hours, alone. The feeling of 'somber reverence' - That is the emotion that I felt.